A Republic; which for centuries was a long divided country surging forward as one, despite consistent tests threatening its path to prosperity. I am speaking of course, of our Rainbow Nation, South Africa, founded by the world icon Nelson Mandela. South Africans are at a critical juncture in our rich history, not unlike Americans. Though a younger democracy, we so too have risen from the ashes of division and racism and have fought tooth and nail to unify a nation which was unabashedly segregated after 400 years of colonisation. Ours was reborn under the leadership of Nelson Mandela, who spearheaded reconciliation and fostered a people’s government to serve their needs. The article which appeared in your publication, under the headline South Africa Vows to End Corruption. Are Its New Leaders Part of the Problem? unfortunately furthers the divisive narrative I suggest. Its authors spin a tale wrought with baseless and unfounded exaggerations and sensational claims that have long been peddled by those who have sought to tarnish my name and image, that of the African National Congress (ANC), my Province of birth Mpumalanga, and our country. Deputy President David Mabuza addresses the Landbou Weekblad and Agri-SA Land Summit in Limpopo on August 23, 2018. I could respond as to the portrait depicted by your Correspondents quite substantively by citing recent South Africa Mpumalanga Community Survey results, for example, which indicate that within our Province, “… 77.3% of households reported that they had access to safe drinking water, 79.8% had access to electricity and over four-fifths (84.7%) reside in formal dwellings” (with over three-fifths of our households reporting that their dwellings were owned and fully paid-off in 2016). However, rather than address in detail the falsehoods and indignities that your publications’ article brought on myself, my Province, my party and our country, which were later rehashed in our national media despite their baselessness, let’s instead do as your Correspondents suggest; let’s discuss the past alleged indignities of our party and our nation – but as importantly, let’s discuss how we plan to address and right them. I’ll start – A great deal more is needed to be done, indefinitely, and undertaken with integrity and transparency, to properly protect the most vulnerable in South African society, as espoused by our party and that of Mandela, the ANC. During South African President Cyril Ramaphosa’s State of the Nation Address, he made clear – the days of State Capture are unilaterally over, as is the rule of those who facilitated and perpetuated it, then stifling our reformative efforts. Our hands are un-tied and we must now also put ‘country first’, before the needs of the so-called elite. The call from the ANC and our President remains to fight corruption with vigour. Let me also address the potential of perhaps our most precious resource and that of our continent – our human capital, and in particular, our next generation, as my commitment here has so too come under question, according to your newspaper. Long before I was a politician, I was a maths teacher, who later assumed the position of school principal and political activist. I was a thorn to the apartheid government who constantly jailed me without trial. And in those roles, I believed that a proper education, based on a responsible curriculum and the infrastructure to allow it, was not only a fundamental human right, but inherent in the weaving of our future’s social fabric. We have been successfully implementing rural development programs focusing on meeting basic needs, such as building new schools and connecting those schools and healthcare facilities to communities by proper roads, accomplished through land reform and rural enterprise development. Over the past four years in Mpumalanga, we have built more than 28,000 homes and provided basic infrastructural services in most of the existing informal settlements, so as to ensure that our people have access to quality living conditions. Our government has concurrently introduced free education for all learners and deserving first-year tertiary students and this will be expanded in future. I personally take great pride in having established five world-class boarding schools, helping some 5,000 farm schoolchildren escape conditions of poverty and denigration, ensuring that they pass through the channels of (and benefit from the opportunities provided by) basic education. We are actively placing emphasis on maths and sciences education within the academic curriculum in the spirit of both geopolitical competition and inward investment, quelling a lingering “brain drain” of our brightest and best. This is a roadmap we intend to see followed. I am the first to admit outright that we still face many challenges in our country and within my province; however, we have made tremendous progress. I categorically refute any allegations that, even within the context of stagnant global economic growth, as a province, we haven’t seen anything other than a consecutive year on year development. There is fiction and then there is fact – our track record speaks for itself. The government of President Ramaphosa is focused on growing our economy, creating jobs and continuing to invest in our infrastructure, our education and our healthcare, etc. The story of a South African child drowning in a pit toilet, as cited by your correspondents, is not a sensational news story to be tragically leveraged (making the victims the only moral casualties), but rather positions the media as an instrument of a smear campaign. The backlog in our schools’ infrastructure is a reflection of the sad history of apartheid and of misdirected policy priority and curbing this remains at the top of our governmental agenda. Just this month, our President launched a high-level intervention to combat a persistent lack of proper sanitation in schools across our country. Further, the assertion to link my political career with how “dangerous my home province is”, resulting in close to 20 politicians dying under mysterious circumstances, has made its rounds in my country for long enough, without substantive evidence from my political opponents. It has deliberately been used to impinge upon my character and besmirch the reputation of my Province, the ANC and our country. Until today, I invited anyone with evidence to lay criminal charges with the police or any other crime-fighting institutions including private prosecution. I have now decided to take legal action against the first person to openly accuse me of murder and corruption. I have fought against corruption and pushed for the delivery of what I believe to be basic services to our people. I have taken the necessary legal steps to force any and all so-called evidence to be brought forward, indeed any evidence that would back such tragically preposterous claims. I have faith in our judicial system and I trust that the outcomes of this criminal case will cease any innuendos and that your publication will carry those outcomes as prominently as they carried said insinuations. Our courts and the judiciary have been long-respected for their independence. Until then, I will not dignify these painful allegations with a response. Let me also be clear; I am no kingmaker in my party. I proudly serve in government at the behest of President Ramaphosa, a man I’ve admired well before he stood shoulder to shoulder with Madiba and the forefathers of our revolution after the unbanning of political parties. I was voted in my position by 2,538 delegates out of 4,708 through a democratic secret ballot. While the quarter century behind us, since the demise of apartheid policies, has seen its fair share of mudslinging, it has also showcased unprecedented socio-economic development. The time has come to look beyond that which divides us and to move forward despite the sensationalism of ‘news for news’ sake’. Ours is to transform our country for the benefit of all our people, especially blacks. Let me lastly clarify – I made my approach of uniting the ANC well before the Party Conferences of years’ past. I abhor divisions, corruption and wrote an extensive paper on ANC Unity against it, in the document, making suggestions as to how the ANC can better unite for the sake of our people, and in some cases, at the expense of politicians such as myself. Any fiction to the contrary or, dare I say it, “fake news” is laughable, if not patronising. The ANC members are not fools and are very independent. We have seen the ANC results at our National and recent provincial elective conferences that voted for unity in leadership. I will continue to call for unity of the ANC as well as the unity of all our Rainbow Nation citizens. We owe our being to Mandela and each other. There is more that unites us, than divide us. The African National Congress has adopted a policy to fast-track land reform constitutionally. Our land reform efforts will thus be handled very differently than that of Zimbabwe’s, as the ANC and our government are very clear on what will work for our country to the satisfaction of all stakeholders. 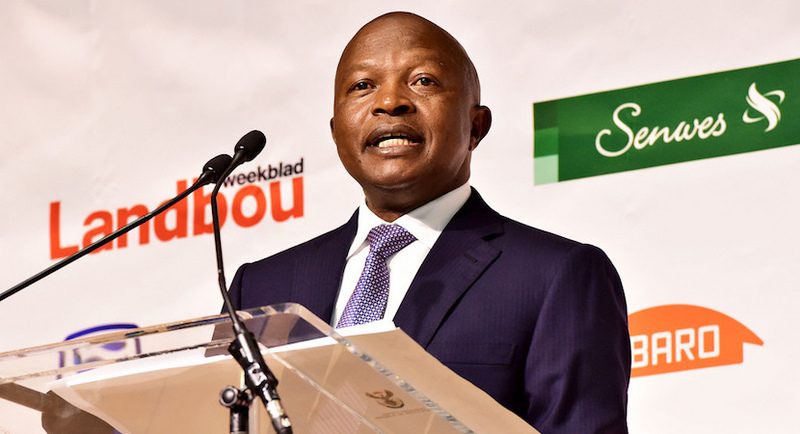 David Mabuza is Deputy President of the Republic of South Africa. This is the response he submitted to The New York Times. The views expressed are his own. An abridged version was published in The New York Times here.